Okonomiyaki is one of Japan’s many comfort foods. Often called a “Japanese savory pancake," this Osaka-specialty dish is a mixture of flour, eggs, shredded cabbage, pickled ginger, and whatever other ingredients you want to put into it, cooked over a teppan grill, then topped with a special sauce, some mayonnaise, bonito and some seaweed. This delightful Japan-original concoction, which appears to be a tortilla stuffed with meat, cheese, and sliced peppers topped with okonomiyaki sauce, is labeled as a “handheld okonomiyaki." You’ll want to try this unique fusion combo to see just how well these two flavors go together! 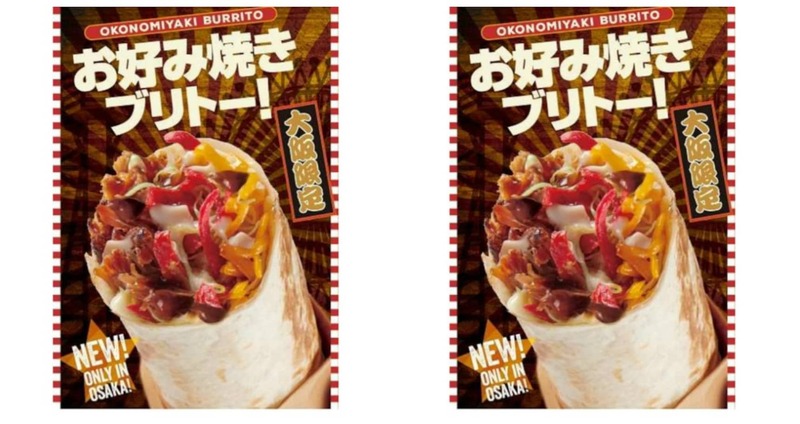 The Okonomiyaki Burrito sells for ¥380 (about US$3.45) by itself, or for ¥700 in a set which includes a drink with chips and dip, or Mexican-flavored french fries. As an Osaka specialty, it is only available in the two Taco Bell shops in the Kansai region: the newly opened Umeda branch, on the first floor of Umeda Station’s Hankyu Sanban Gai Festive Court; and the Dotonbori shop, near Namba Station. So if you want to try it, you’ll have to make it a stop on your next trip to Osaka!